This is a common concern that I hear from patients on a daily basis. Many of my patients are very concerned about this and have even noticed on occasion a blue discoloration of their toes. Should one be concerned about these symptoms? The answer is yes. Most likely it is just due to changes in the temperature but on occasion it can be due to a more serious condition called peripheral vascular disease. It can also be due to a condition called Raynaud’s which will cause the blood vessels to spasm which in turn will cause a bluish discoloration to the toes. This however is only temporary and the toes should return to their normal color. What we are most concerned about is peripheral arterial disease. This condition is usually perpetuated by smoking diabetes and obesity. 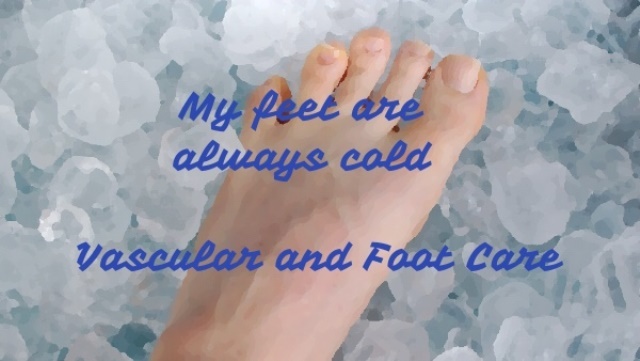 Patients will usually complain of coldness in their feet but even more important is complain of severe pain when resting which is relieved when hanging their feet off the side of the bed. These complaints are very suggestive for peripheral arterial disease. When I hear these complaints and also have difficulty getting foot pulses a test called an arterial doppler will be ordered. This test consists of multiple blood pressure cuffs along the lower extremities which will determine if there is in fact a blood flow issue to the feet. If in fact this test does come back abnormal my patients are immediately referred to the vascular surgeons who are the true specialists when dealing with blood flow problems. If you are having these types of symptoms please don't wait to schedule an appointment with your podiatrist. Waiting can result in more serious complications including invasive vascular surgery gangrene and even amputation.